One of the most common branding tips you will find for your business or website is to create a Facebook page. For this reason, I am sharing with you in this article a complete tutorial on How to create a Facebook page for your business website. If you are not sure why you should create a Facebook page, read on! Our target for you in this post is to illustrate how you can have a Facebook fan page for your brand in 15 minutes’ time. Facebook is one of the most popular social networking websites out there, with 1.038 billion daily active users worldwide. 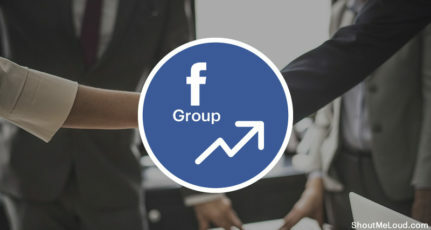 By creating a Facebook fan page, you are allowing your potential readers, clients, and customers to connect with you. Depending on your social media skills, you can engage your Facebook fans in conversations, and make your brand more prominent. In fact, many companies are even using Facebook as an announcement channel. With 1,.59 billion monthly active users, if you brand is not on Facebook yet, you are losing a lot of good things on the plate. Facebook is one of the biggest marketing and branding tools available & many brands are solely relying on Facebook for their existence. Well, I’m sure you are aware of these facts, that’s why you are all set to create a Facebook page for your blog, existing business, a new brand or may be for your upcoming startup. 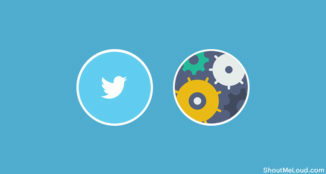 Facebook fan pages help you to brand, socialize and send messages to all of your blog or website fans. If you have not yet created a Facebook fan page for your blog, do it now and enjoy taking your brand to the next level. Go to this create a Facebook page link, and select the type of business you have. 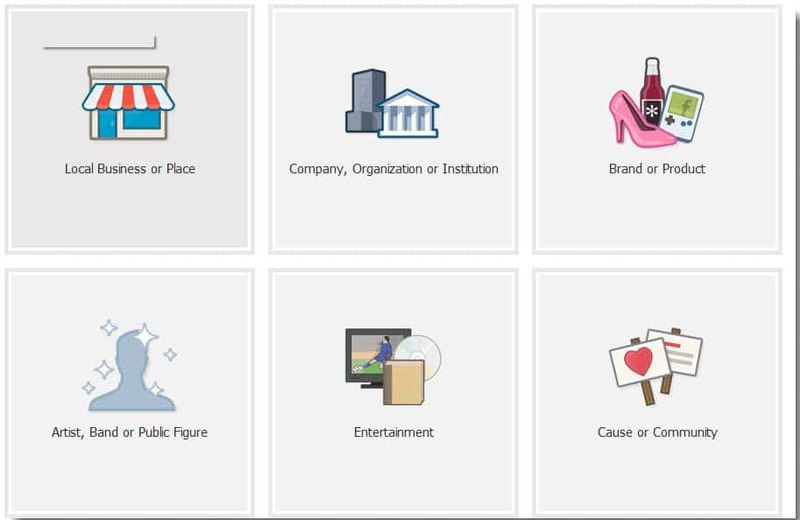 Selecting the proper category will allow your brand to reach the right audience. 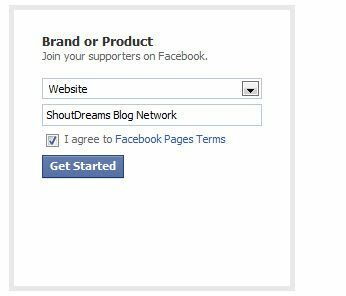 For example, if you need a fan page for your website or blog, select “Brand or Product” and select “websites” from the drop-down menu. Next, add your brand name. 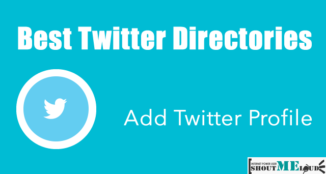 This is not a vanity URL, but you can add a custom URL from your fan page later. 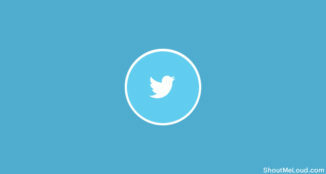 Click on “Get Started”, and then add the details and choose an avatar for your fan page. I would suggest using your official Gravatar, and if you don’t have a Gravatar, you can always create a picture for your fan page that is similar to your brand’s logo. Note: the maximum size for your Facebook fan page profile pic is 180*540 px. Once you’re finished uploading your picture to your newly created Facebook fan page, Facebook gives you an option to invite your friends to your fan page. You can skip this for now if you wish, and return to this feature later. On the next page add your website details, and click on “Continue.” Once done, you will have a page like this (see image below), and you can hit “Like” and recommend people, and also edit page settings. Once you have learned how to create a Facebook fan page, it’s time to learn how to edit your fan page. 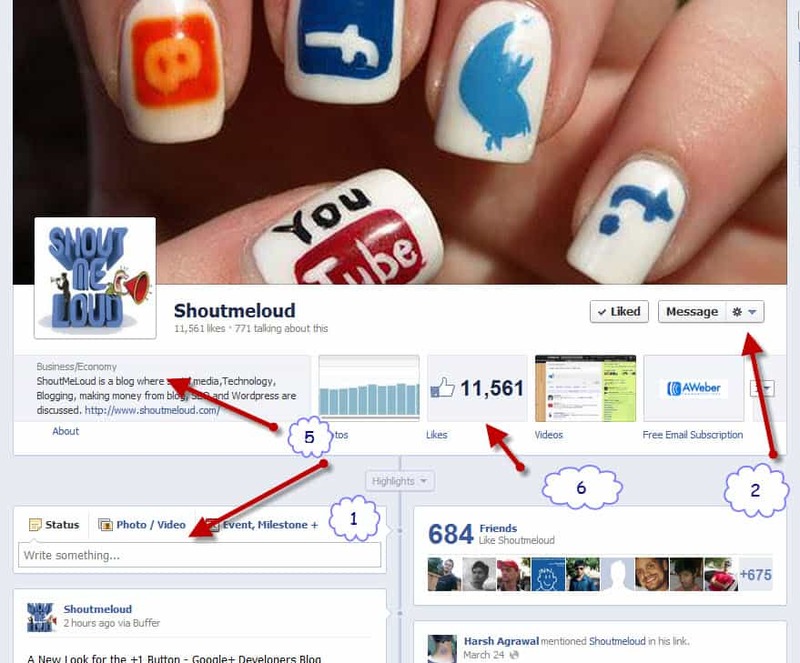 Having a look at this screenshot will give you great many ideas about the customization options of Facebook fan pages. Like our Facebook profile, this is the wall for the Facebook fan page. 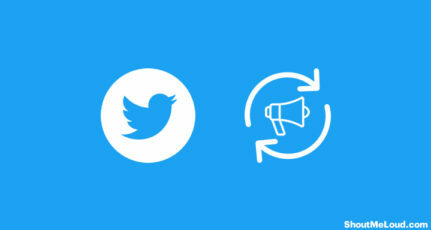 You can use it to upload images, text, share links, ask questions and upload videos. I would suggest that you use in as creative a manner as possible. Apart from publishing your latest post to your fan page using RSS Graffiti, I also suggest you that you work on asking interesting questions and engage your users in conversation. 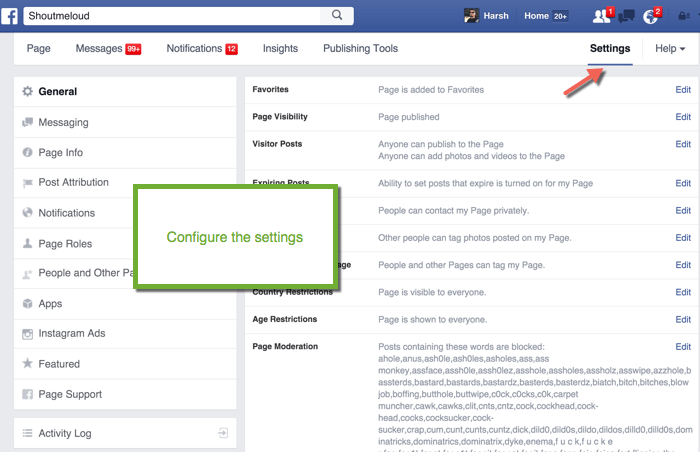 As you are editing your Facebook fan page, you will find the admin management page of Facebook, and from there you can take various additional actions related to your newly created fan page. Sometime back, Facebook added a new feature to Facebook pages for businesses, and it allows you to use Facebook as a profile. You can “Like” other Facebook pages, and comment using your Facebook fan page name. 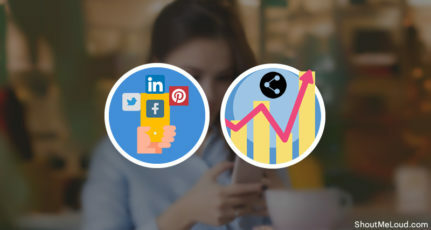 You can not add another user to your Facebook profile, but from a branding point of view, you can effectively use this feature to make your reach wider. You can engage in conversations and discussions, and if you are an expert, your answers will help you to get genuine fans. 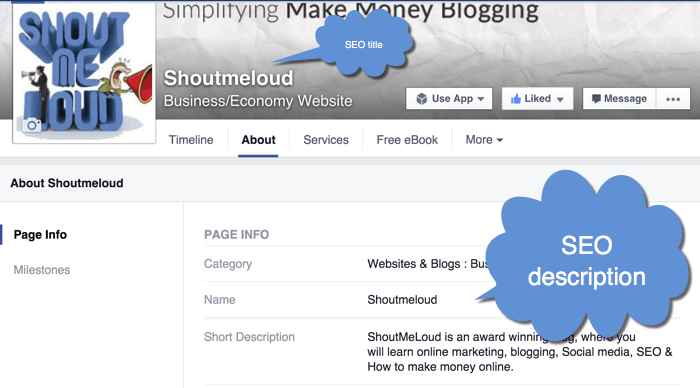 In this post, I’m not going to elaborate on how to optimize your Facebook page for SEO, but it is important to note that your “About” section works as a meta description with search engines. For this reason, you will want to write your “About” section carefully, so that it is easier to rank for any keyword using a Facebook page. So –choose your name and the contents of your “About” section carefully. You should also download official Facebook page manager app for Android & iOS, which would make it easier for you to manage & update your page from your smartphone. If you also need to create a landing page for your Facebook page which is great for email capture, offering tripwire, you can do that easily with Leadpages. I would love to know if this tutorial helped or inspired you to create a Facebook business page for your business or website. Do you think it’s necessary to have a Facebook page for every brand and business? Tell us what you think using the comments section below. And as always, if you find the information in this post useful, please share it with your friends and colleagues on Facebook, Twitter and Google Plus. Great, easy to follow guide. 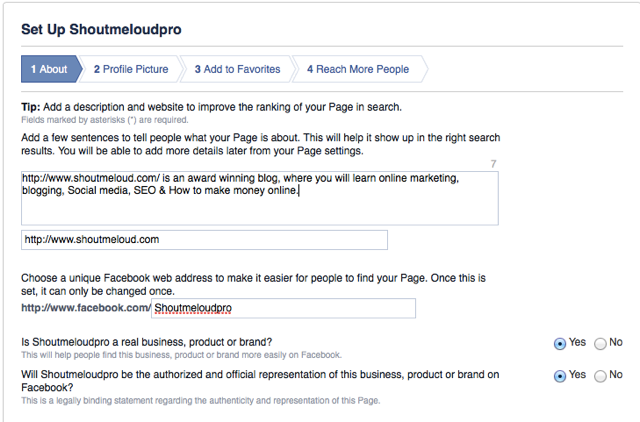 Pages are definitely the best for businesses/brands – you can even have verified ones. Adding the little map to your page with your correct address allows you to let users check in when they visit you – which can be really useful! Also it’s a good idea to add opening times and in some cases you may want to allow customers to review your products on your page which is also an option. Facebook has over 1.65 billion monthly active users so it is a great way to reach out to potential customers. Harsh sir, it was a nice article. But, please tell me what is the difference between Facebook page and a Facebook group. It seems both are the same thing. I’m trying to create a Facebook page for my blog but when I click the drop down menu to select ‘Website’ it instantly asks me to log in. I do not have a personal account so I am unable to. Any ideas? Hi.. A very good article for a new blogger like me. So now I am trying to open a facebook page for my blog but I have only 2 facebook types visible – “business or brand” and “community or Public figure”. The other options also though means same, the display is different. Why do you think that is? You should select between “Brand”. If your blog is under your name then you can pick “Public figure”.